Sugar skull pendant with 6 mm x 8 mm Mexican fire opal cabochons set in the eye sockets. Other colors of stones are available contact us for details ....The pendant hangs from a custom bail with a matching flower on it on tan leather cord. 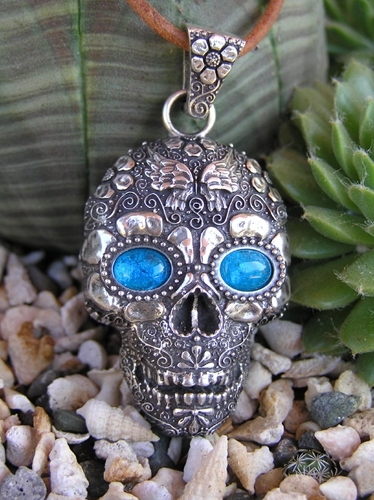 The skull of this pendant is 40 mm high x 28 mm wide. Sterling silver. Limited edition of 20.